On this page I would like to share some of my sources of inspiration. Very interesting website with pictures of visual spectacles - rainbows, halos, glories, coronas and many more with explanations about how they occur. In August 2011 I joined the Dutch Lighting Design Insitute to made a study trip to See! Colour!, an international event / exhibition on light and colour in Sweden. James Turrell, one of the world's leading artists working with the theme of light, colour and space, created a number of large installations. There was also an exhibition on Goethe's Colour Theory with interactive colour experiments and a series of outdoor colour installations in the garden. NuFormer was invited by an international organization to design and develop a demo of a 3D projection on a building in California, USA. The facade of this modest building turns into a middle-age wall, hiding and showing surrealistic elements. It also turns into an African jungle cabin and later into a US metrostation. Even the whole building flips over! This projection was executed on August 2010. In the Kunsthal Kade in Amersfoort, you can see a exhibition of shadow art installations. Very inspiring to see. During my holiday last summer, I met a photographer who made light-grafity pictures. You can see more photo's on his Flickr page. By chance I came across the website of Lichtfaktor. Lichtfaktor is a group of artists who paint with light with a technique that is called light writing. 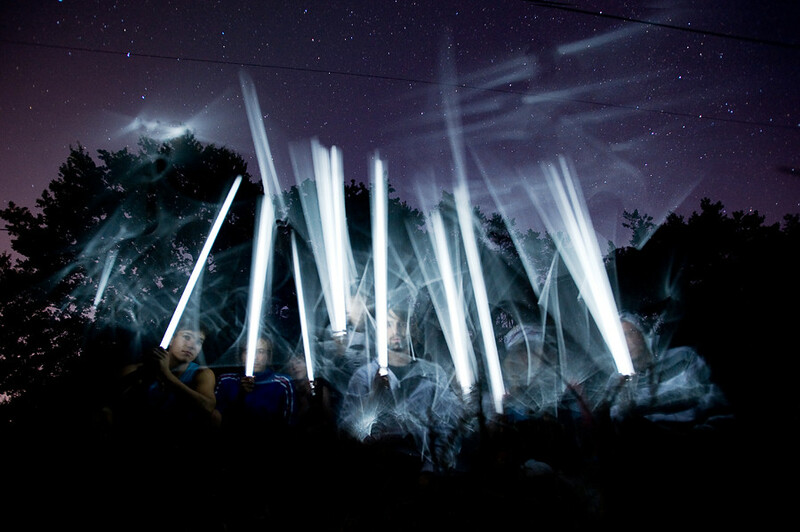 Light writing is made with a long exposure photograph of small lights that are moved quickly so they become visible as a line on the photograph. This way, they make the most beautiful pictures and even a sort of cartoons as you can see below. Lighting design with LED in theatre. Workshop, organised by the International Lighting designers Organisation (iLo). With a group of young lighing designers we explored the possibilities of LED in theatre lighting designs. Book of David K. Lynch en William Livingston about light phenomena in nature. There's an ancient myth that the light in Holland is different from anywhere else. It's the legendary light we see in paintings. The movie Dutch Light examines this phenomenon and it is an ode to light and to observation. It turns looking into a new experience. Over the whole planet I find light that moves and inspires me. The most beautiful lighting images can be found outside. Therefore, this can not be missed on a page about inspiration.